What Are These Ugly Bugs in Shreveport? Update 2: The local news covered it. More gross! 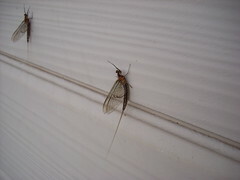 Update: Kevin Messenger, my coworker, commented and said that they are Mayflies! Gross! What are all these ugly bugs in Shreveport? They were all over our stairs this morning, completely covering them at work. Jenny’s girlfriend said that when she was crossing the bridge into Bossier City, the bridge was covered with them. What are they? 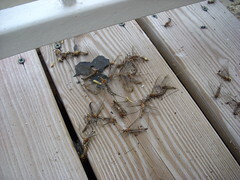 They’re ugly and they were acting like they were dying on the stairs, flapping their little wings. I’m creeped out by them. What is this fuzzy bug? Everybody knows birds can’t talk. Do You Have a Job??? Do you have a job??? Do you have $149??? Then you could be approved for a brand new Kia from Elkins Kia! Radio: Do you have a job??? Radio: Do you have $149??? Person: No… I just said I don’t even have a job. I know that blog post was of little substance, but it still amused me, and as Chris and I always say, something is always better than nothing. It’s been 161 days since my last blog post, far too long. Lots of stuff has happened in my life since then. The anniversary of my birth has passed once again, and I’m 25 now. I’ve loved. I’ve lost. I’ve been things in between. I’ve been sick. I’ve had a tooth pulled out. My car was flooded in a flash flood. All of these things were bloggable events, and perhaps I will blog about them in the future. I plan to write a few blog posts, at least, about some Web 2.0 services that I’ve been using. I needed this post to at least break the ice for myself to be able to start blogging again. 161 days is a scary amount of time to go without writing anything. Twitter has been stealing a lot of my writing outlet mindshare. I blame it, even though I just recently started using it. It’s just too damn easy to blurt out a quick thought on Twitter than it is to make a well reasoned post here. I hope to be better, at least in the near future.